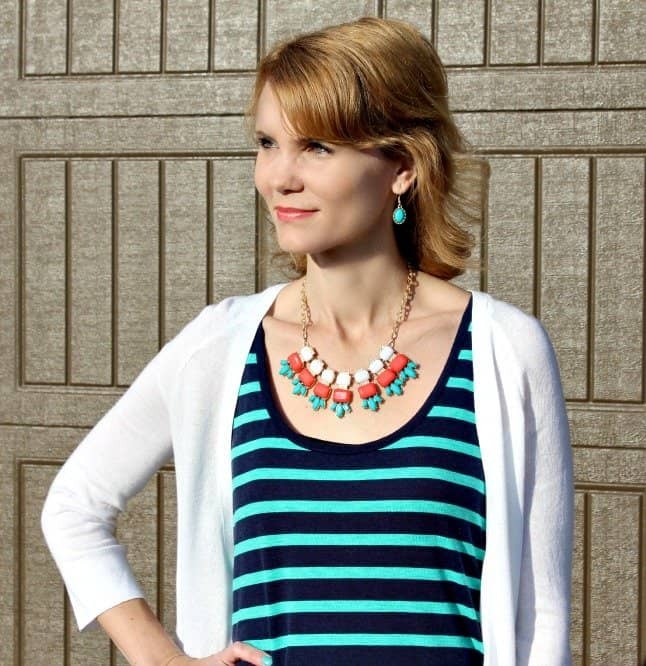 If you love jewelry and want to really show off your own unique style, one way to do so is by wearing what what is called a statement necklace. What does the term “statement necklace” mean? Simple. It’s a necklace that makes a huge statement when you put it on – that’s the essential definition. Often, the necklace is large-sized and quite possibly over the top. There are many many different styles of statement necklace, and we want to share some of them with you in this quick guide to statement necklaces. Once you browse through them, you will hopefully start to get some absolutely fantastic ideas for when, where, and how to adorn yourself with one of these fashionable necklaces. 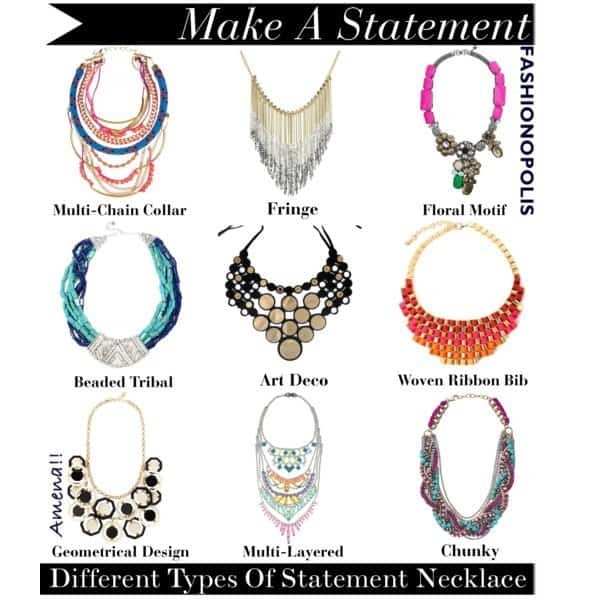 We’ll start by showing you this chart that we came across on Fashion-opolis, showing the various types of statement necklace. As you can see, this chart shows a fair number of “types” of these statement necklaces that Fashionopolis mentions here, but, we must say, we don’t really like being confined to charts to inform our fashion sense. 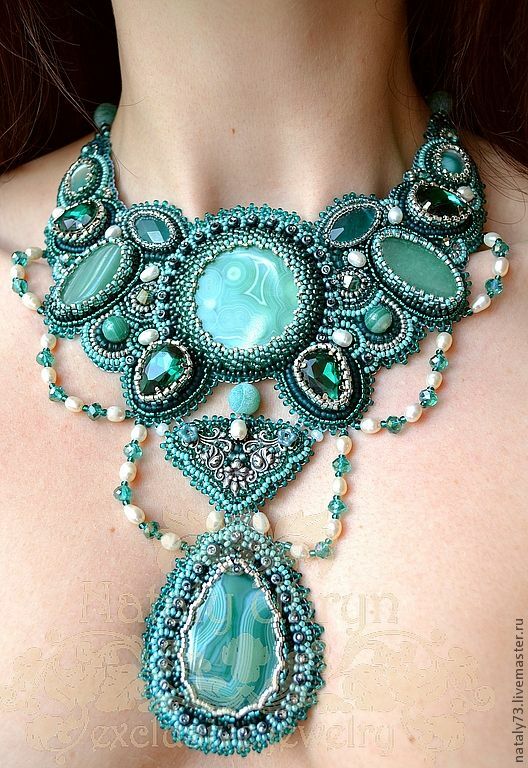 We found this spectacular bib-style statement necklace while browsing the page of talented Russian necklace-maker nataly73, who models her own pieces over at livemaster.ru. If you check out her style, you might agree with us that a lot of it is just fantastic! This piece, in particular, attracted our attention because of its colors, shapes, and just the detail you can see in the work. It looks like Nataly makes a lot of what are called “massive” statement necklaces, because they are just that – massive. You know how they say “Go big or go home!”. Well, Nataly certainly isn’t afraid to offer up a necklace you simply can’t ignore. With her combination of gems, beads, and subtle color patterns, we could stare at her work for hours! 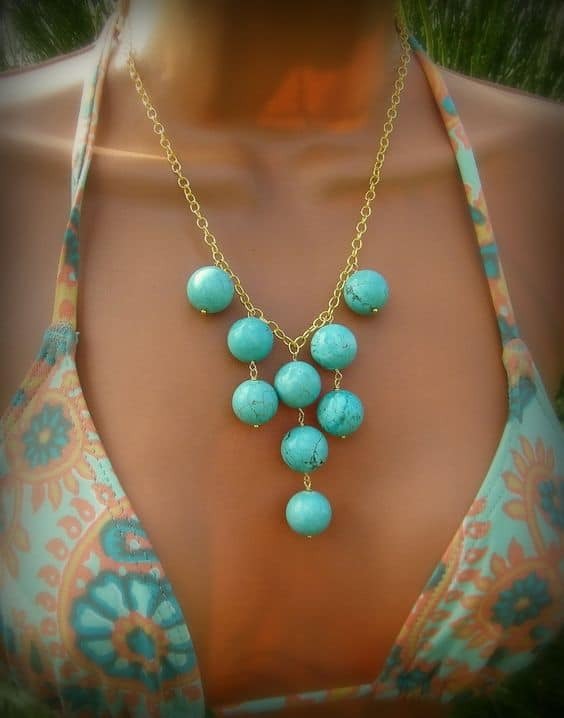 We came across this necklace while browsing over on Glam Radar. This relatively simple statement necklace we love partly because of how it goes with this outfit she’s wearing, not to mention her darker skin tone, hair color, and even her glasses come into play here to add an air of mystique. She compliments the necklace, and it compliments her right back. We love how the white of the necklace pops against the black of the dress, with parts of the necklace matching her two bracelets. Since the necklace is a combination of white and gold, you can see that even her purse’s gold chain relates in some way to the necklace itself. Compared to some statement necklaces you’ll see, this one isn’t exactly the most “massive”, but compared to a normal necklace, its fairly large, and this is something else to consider. Which is, if you are moving around a lot, and you have a fairly large necklace around your neck, it will at some point become cumbersome. These are the practical things to consider, not to mention bending over. The woman in this image seems to be on the go, but we can guarantee she probably isn’t in a hurry to catch a bus. Nothing Says Fun Like Bubbles! Is it just us, or are bubbles just plain fun? The bubble style of statement necklace is definitely a step in that direction, where you’re making a statement, but you’re not trying to be too frou frou about things. One thing we can say about this style of statement necklace is that they are generally lighter, which means you could wear them rollerblading on a boardwalk, or doing a variety of light activities. 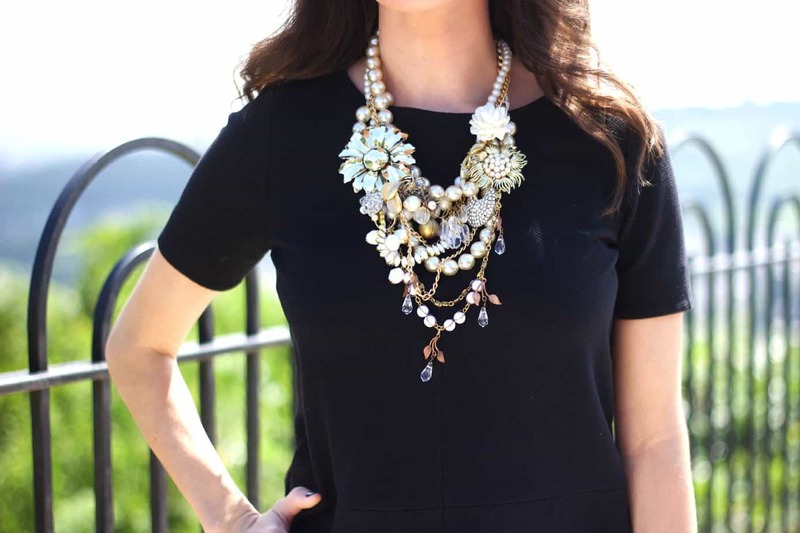 The statement you’re making is something along the lines of “let’s have fun!”, and as such, these types of statement necklaces come in a variety of fun and often solid colors. Some of these bubble-style necklaces are transparent, and really give the impression of actual bubbles, and this is when they start to look a lot more delicate, like an actual bubble you’d see in water or a shiny soap bubble floating through the air. The materials for these necklaces can be diverse as well, ranging from simple beads of various sizes, to glass. We hope this helped you learn what a statement necklace is, to some degree. Once again, it is simply a necklace that makes a rather grand statement, usually by being somewhat larger and more over the top than your average necklace would ever dare to be. In this way, you’ve got to be a bit daring to try and pull the look off by wearing one yourself, but such is the adventure that is fashion. There are, of course way too many different types of statement necklaces to mention, but we hope in this brief guide to just a few, it sparked enough of an interest in them that you might start seeking them out and seeing what’s available out there. Most likely, we’ll be talking more about statement necklaces in the future as well! Good luck with your search, and don’t forget to rock that necklace for all its worth!